The Repurposing and Sharing Digital Content credential sits within the Digital Literacy stack. This stack is designed as a tool to support lifelong learning; to prepare you for living, learning and working in a digital society. These days, online promotion is all about content. Whether you're spruiking a business or a product, or looking to boost your own profile, having a steady stream of interesting new content helps draw people to you online and keeps them coming back. There's just one problem: creating new content takes time, research and investment, which is why getting savvy with your online strategy involves finding inventive ways to reuse content you've already created. This course helps you manage and curate your digital content, giving you ideas and tools to repurpose the content you've already created into different formats whether it's a blog post, image or infographic. You'll also develop techniques for storing and organising your content, and learn effective ways to share content with your personal and professional online networks to boost your online presence and get yourself noticed by employers. 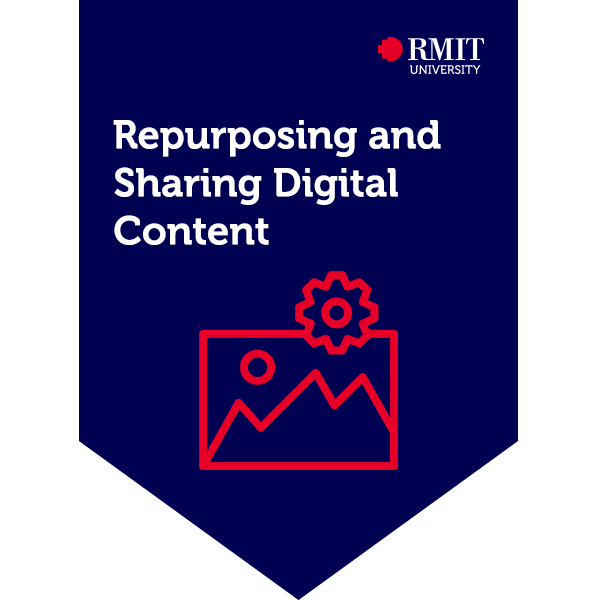 By completing project tasks and online assessment the earner of this credential showed their ability to curate, store, organise and repurpose digital content, and showed an understanding of how to share and communicate content to others online.